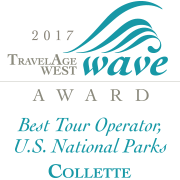 Collette has a rich tradition of bringing great tours, wonderful memories and unique travel experiences to our travelers around the world. Our sites and applications are created to connect you – our most important traveler — with the best that Collette has to offer on the platforms and devices you prefer. Registration information you provide when you create an account, including your first name and surname, country of residence, gender, date of birth, phone number, email address, username and password. We periodically review your personal information to ensure that we do not keep it longer than it is needed. Transaction information you provide when you request information or purchase a tour or service from us, whether on our sites or through our agents, group leaders, our call centers, or direct mail - including your postal address, telephone number, and payment information. Information you provide in public forums on our sites and applications. Information sent either one-to-one or within a limited group using our message, chat, post, or similar functionality, where we are permitted by law to collect this information. Usage, viewing, and technical data, including your device identifier or IP address, when you visit our sites; use our applications on third-party sites, or platforms or open emails we send. Telephone calls that you make to our call center may be monitored or recorded; this will assist in training our staff and improving our service to you. We collect information through technology, such as cookies, Flash cookies, and Web beacons, including when you visit our sites and applications or use our applications on third-party sites or platforms (see information on cookies in Section 3). Understand the number of visitors to this website and the pages visited. Please note that with most browsers, a customer can set the preferences to show a warning each time a cookie request is received. You can also set the browser not to accept cookies at all. However, to make your experience at www.GoCollette.com as convenient as possible, we suggest that you allow your browser to accept cookies. For further information on cookies, we recommend you visit www.allaboutcookies.org. A member of the Collette Team, which includes several different brands [Collette, Explorations, Collette Family, Royal Horticultural Society Garden Holidays, AAA Member Choice Vacations, AAA Vacations, Marriott Vacation Club, among others] will be the data controller for your information. The relevant data controller(s) can be determined here. To secure payment and provide you with the products and services you request. To communicate with you about your account or transactions with us and send you information about features on our sites and applications or changes to our policies. To market or sell Collette product to you or to offer you other travel related products that they feel may be of interest to you. Provide you with advertising based on your activity on our sites and applications and on third-party sites and applications. To learn more about how we use your information for personalization and tracking, please see your Controls and Choices. Securing payment for products and services purchased through Collette. We may use your IP address to help diagnose problems with our servers and to administer our websites and to estimate the total number of internet users who visit our websites from certain countries or regions of the world. You may change your choices for receiving various types of marketing materials alerts. You may choose to access certain third party social media websites and services (such as Facebook) through our site. When you do so, you are sharing information with those sites and the information you share will be governed by their privacy policies (including that the site may share information with us). You may also be able to modify your privacy settings with these third party social media websites. Please refer to the relevant provider policies for more information. Collette will offer the individuals the opportunity to opt out, whether their personal information is (a) to be disclosed to a non-agent third party or (b) to be used for a purpose other than the purpose for which it was originally collected or subsequently authorized by the individual. We want you to feel confident about using Collette and we are committed to protecting the information we collect. The security, integrity and confidentiality of your information are extremely important to us. We have implemented technical, administrative and physical security measures that are designed to protect traveler information from unauthorized access, disclosure, use, and modification. From time to time, we review our security procedures to consider appropriate new technology and methods. Please be aware though that, despite our best efforts, no security measures are perfect or impenetrable. Our website is a “digitcert Secure Website”. All sensitive information, such as credit card information, is transmitted using the latest SSL (secure socket layer) technology, which ensures that any communication between your computer and Collette is unreadable by anyone else. Your details are communicated in a secure encrypted format. However, no data transmission over the Internet can be guaranteed to be totally secure. While we strive to protect your personal information, we cannot ensure or warrant the security of any information which you send to us, and you do so at your own risk. Collette will use personal information only in ways that are compatible with the purposes for which it was collected or subsequently authorized by the individual. Collette will take steps to ensure that personal information is relevant to its intended use, accurate and complete. Collette verifies that it adheres to all of the Privacy Shield Principles concerning the transfer of personal data from the European Union ("EU") to the United States ("U.S."). As part of this, we follow the Privacy Shield Principles published by the U.S. Deportment of Commerce ("the Principles") with respect to all such data. To learn more about the Privacy Shield program please visit the U.S. Department of Commerce: https://www.privacyshield.gov/. Individuals who wish to file a complaint or who take issue with Collette's EU U.S. Privacy Shield Principals should contact Collette's Consumer Advocate. Collette's Consumer Advocate will explain the process to be followed when filing a complaint. Collette subscribes to the American Arbitration Association's International Centre for Dispute Resolution as its independent complaint resolution provider. If consumers can’t resolve a complaint after contacting Collette's Consumer Advocate, they may file a written complaint with the American Arbitration Association. These services are provided at no cost to the consumer. Collette will investigate and attempt to resolve all complaints and disputes in accordance with the principles contained in this policy. Collette will conduct compliance audits of its relevant privacy practices to verify adherence to this policy. Any employee that Collette determines is in violation of this policy will be subject to disciplinary action up to and including termination of employment. Collette is required to disclose personal information in response to lawful requests by public authorities, including meeting national security or law enforcement requirements. Sensitive personal information means personal information that reveals race, ethnic origin, sexual orientation, political opinions, religious or philosophical beliefs, or trade union membership, or that concerns an individual’s health. Notice may be by email to you at the last email address you provided us with, by posting notice of such changes on our sites and applications, or by other means, consistent with applicable law. Personal information means information that identifies (whether directly or indirectly) a particular individual, such as the individual's name, postal address, email address, and telephone number. When anonymous information is directly or indirectly associated with personal information, this anonymous information also is treated as personal information.